Since a and b represent lengths of segments, their values are non-negative! Keep this in mind as you answer the questions below. What is the slope of line j? Write this slope in terms of a and b. What is the sum of the measures of the blue acute angle and pink acute angle? Explain how you clearly know this to be true. 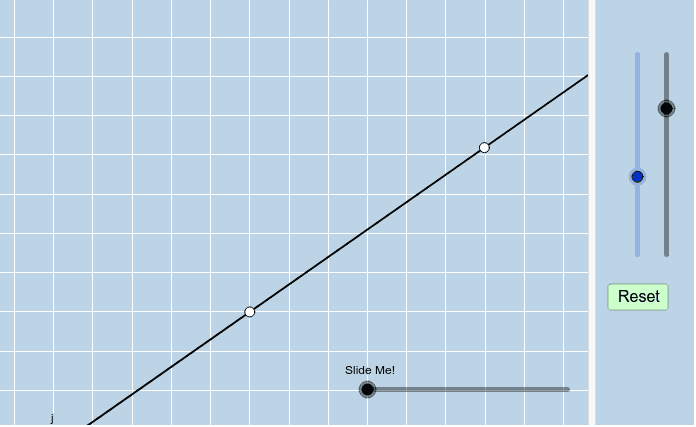 What is the slope of line k in the applet above? Write this slope in terms of a and b. Suppose a = 4 and b = 5. What would the slope of j be? What would the slope of k be? Suppose a = 12 and b = 7. What would the slope of j be? What would the slope of k be? Suppose a = 6 and b = 1. What would the slope of j be? What would the slope of k be? What geometry vocabulary term (adjective, really) describes the intersection of lines j and k? What can you conclude about the slopes of 2 (non-vertical & non-horizontal )perpendicular lines in the coordinate plane? Color the solution to a system of linear inequalities.